Environmental Health Safety & Risk Management would like to remind the NMSU community to fully close and fully label each of your hazardous waste containers. NMSU undergoes unannounced New Mexico Environment Department/Environmental Protection Agency compliance inspections, and steep fines can be levied. Please ensure all of your hazardous waste containers are fully closed (vapor tight and leak proof) and fully labeled with an NMSU Hazardous Waste Tracking Form and/or NMSU Hazardous Waste Sticker, which is completely filled out. 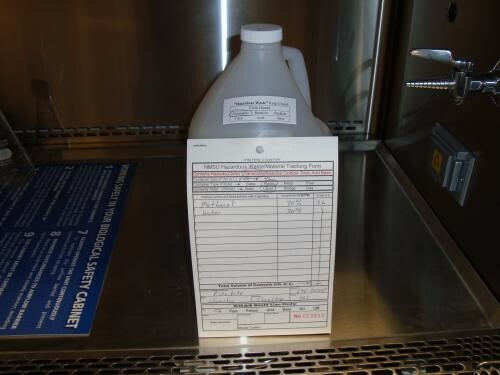 If you need blank tracking forms, stickers, or have questions, call EHS&RM at 575-646-3327.